This episode of the Adventures of Nero Wolfe first aired on February 2, 1951. This episode of the Adventures of Nero Wolfe first aired on March 16, 1951. This episode of the Adventures of Nero Wolfe first aired on April 6, 1951. This episode of the Adventures of Nero Wolfe first aired on January 5, 1951. This episode of the Adventures of Nero Wolfe first aired on December 8, 1950. This episode of the Adventures of Nero Wolfe first aired on November 17, 1950. 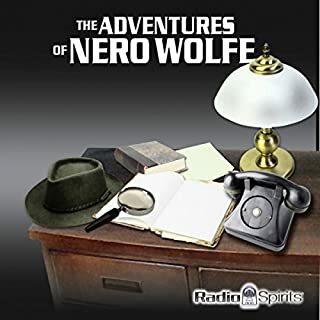 Nero Wolfe, featured in 46 novels, movies, and television series, first came to radio on April 7, 1943. The great character actor Sydney Greenstreet played him from 1950-51. Wolfe, the "gargantuan gourmet", solved crimes with an attention to detail that rivaled the great Sherlock Holmes. The overweight detective of Rex Stout's novels refused to leave his elegant brownstone on business, sending his wisecracking, two-fisted assistant, Archie Goodwin, out to do his legwork. This peculiar private investigator preferred tending to his beloved orchids over solving crimes. In fact, the only reason he worked at all was to keep up his lavish lifestyle.